High on the Shonto Plateau, overlooking the Tsegi Canyon system in the Navajo Nation in northeastern Arizona, are three of the largest surviving cliff dwellings of the Ancestral Puebloan people. The structures, called Betatakin, Inscription House, and Keet Seel, along with the cultural materials left in them, tell the story of everyday life and cultural change at this remote place. In the 13th century, Ancestral Pueblo Peoples constructed cliff pueblo villages on the bedrock of large alcoves in the canyons of northeastern Arizona. A dozen or more households, each consisting of a large extended family, made their homes in the village. Each family maintained one or two open courtyards, living rooms, storage rooms, and granaries. Shortly before 1300, everyone in the region left for the Hopi mesas in the southern deserts, and perhaps as far as northern Mexico. The homes they left behind look almost exactly as they did 700 years ago. Subsequently, other cultures moved into the region. Many archeologists and anthropologists believe that the Navajo migrated from the north between A. D. 1400 and 1525. Navajo oral tradition suggests an earlier arrival, around A. D. 700 or 800. When the Spanish arrived from the south in the 1540s, the Navajo were already well ensconced on the Colorado Plateau and their numbers were growing. The Navajo were hostile to outsiders - be they Anglo or Indian - and they dominated northeastern Arizona and northwestern New Mexico until the early 20th century, when an influx of eastern Americans began to develop the western frontier. In August 1868, the Navajo Reservation was established. Newcomers smashed ancient pots for sport, or dismantled ruins to use the stones for new structures. At the same time, anthropologists and archeologists registered their concern for southwestern sites like Keet Seel. In 1909, William B. Douglass recommended the establishment of Navajo National Monument to protect the ruins for study by professionals. 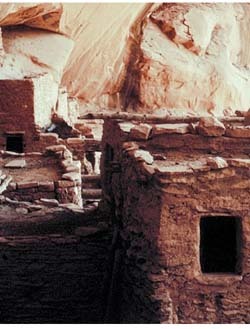 On March 20, 1909, President William H. Taft signed the proclamation to create Navajo National Monument for “a number of prehistoric cliff dwellings and pueblo ruins … which are new to science and wholly unexplored, and because of their isolation and size are of the very greatest ethnological, scientific, and educational interest” (Proc. No. 873). Numerous intact floors and roofs, even intact hearths with ashes, testify to the astonishing preservation of Keet Seel and contribute valuable insight into pueblo architecture and ancient peoples' ways of life. The modern Navajo and the National Park Service have a strong partnership. Navajo work at the national monument; their ancient and contemporary histories are interpreted there; and Native people operate a gift shop. Betatakin and Keet Seel each sit on 160 acre islands of federal land surrounded by the Navajo Nation. Located approximately 30 miles to the east of Betatakin in Nitsin Canyon, Inscription houses occupies a shallow alcove on 40 acres of federal land. The Monument leases a 244.59 acre parcel for its visitor center, maintenance facilities, and employee residences from the Navajo Nation. The National Park Service and the reservation cooperatively present educational programs and other activities. Today, more than 107,560 visitors come to Navajo every year to take ranger guided tours into the ruins. In addition to the tours, visitors can enjoy two self-guided trails, two campgrounds, a picnic area, and a museum exhibit in the visitor center. “We consider Navajo National Monument the loveliest place we know. We are aficionados of Anasazi ruins, and consider Betatakin the prettiest, nicest, and most impressive of the ruins we have visited. The Monument staff are absolutely top-notch-professional, well informed, articulate and what I think I would describe as 'passionate' in sharing their knowledge of and respect for the Monument and the past culture it represents - and the current employees, Navajo and otherwise, who represent that to visitors. There seems to be a great deal of pride in keeping the grounds and facilities up to highest standards, clean and inviting. Thank you for sharing this lovely historical site with us. I love the place. We will be back.